Presently they came to Northam Park’s vaunted Tapestry Room. Its walls were entirely covered by specially commissioned tapestries from the Gobelins tapestry weavers of Paris. Griffin seemed quite taken with one in particular. “Oh, that bloody thing,” Diana swore under her breath. Griffin’s excessive scrutiny of the woven masterpiece made her uncomfortable. Not because the goddess of the hunt wore a short tunic, baring her legs, striding toward the sea to save her fellow virgin from the amorous king of Crete. It was the memories of it that she had held as a girl, childishly imagining herself to be just like the huntress. Free, independent and disdainful of mortal men. How naive she had been. To have a Gobelins tapestry, let alone a room full of them, was a mark of distinction in Regency home decor. Gobelins Manufactory began as a group of Flemish weavers established by the first Bourbon king of France, Henry IV. They set up shop in Paris in the environs used by a family of dyers from an earlier century called the Gobelins. The name stuck and the Gobelins enterprise became the royal factory supplying the French monarchy until it was shut down in the Revolution. The restored Bourbon dynasty revived production and today it is operated by the French Ministry of Culture. Newby Hall has a marvelous tapestry room that is well-presented in the 2007 movie adaptation of Jane Austen’s Mansfield Park. See this link for an excerpt from the movie. The room is featured at 8:15. 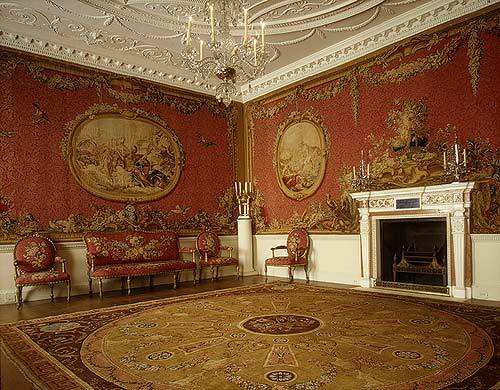 There is another tapestry room that used to reside in Croome Court, Worcestershire. It was removed from the neo-Palladian country house by the owner, the ninth Earl of Coventry, and sold. Note the lovely neoclassical ceiling designed by Robert Adam, executed in 1763 for the sixth Earl. It has been reconstituted for display at the Metropolitan Museum of Art. Today, Croome Court is most noted for its grounds, designed by Lancelot ‘Capability’ Brown. The house itself had been owned by a succession of groups including a school and Hare Krishnas before it was finally acquired by the National Trust from the Hare Krishnas, After extensive restoration work, it too became open to the public for the first time in 2009. This entry was posted in Notorious Match, Regency, Uncategorized and tagged Chatsworth, Croome Court, Earl of Coventry, English country estate, Gobelins, Newby Hall, Notorious Match by Angelyn. Bookmark the permalink. Thank you, Vivian. The tapestries would have certainly been much more colorful just produced, the dye still reeking (probably) as they were hung up the first time. I think about how these vivid, complex designs must have looked to the brand new scullery maid just fetched up from a nearby farm. Thank you, Marion. That’s the best part about sharing this with others. Loved the post and your blog. 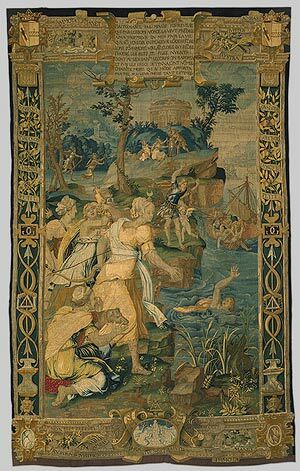 There is no doubt many wonderful tapestries have been lost to us by various means. I remember the tapestry at the castle in Blois. It was discovered in an orchard where it was being used to cover the plants against rain and snow. Now it is housed with dim light and archival standards to preserve this piece of history. Thanks for sharing. I must correct my previous post. It was Chateau d’Angers and not Blois. Angers has the largest collection of medieval tapestries in the world. Fortunately, the tapestries survived WWII. Gosh, I think a munitions dump stored in the chateau, if I’m thinking of the right one, blew up during WWII when France was under Nazi occupation. Amazing anything survived.